Design: We recruited a total of 87 ART-naïve, HIV-positive individuals aged 18 to 60 years through the networks of five non-government organizations working with HIV-positive individuals. We collected data on the history of ART initiation, CD4+ cell count monitoring, socio-demographic variables, perceived family support (measured with 10-item Nepali Family Support and Difficulty Scale), depression, and HIV symptom burden. Correlates of ART eligibility were examined using multivariable logistic regression analysis. Results: A total of 72 of the 87 ART-naïve participants (82.8%) had monitored their CD4+ cell count in the past 6 months. Of these, 36 (50%) participants were eligible for ART initiation with CD4+ cell count /mm3. A total of 12 participants had CD4+ cell count /mm3. Lower level of perceived family support was associated with 6.05-fold higher odds (95% confidence interval =1.95 to 18.73) of being ART eligible with a CD4+ cell count /mm3. Conclusions: High rate of delays in ART initiation and the strong association of low perceived family support with ART eligibility in our study participants suggest that HIV service providers should consider the role and impact of family support in influencing individual decisions to initiate ART among eligible HIV-positive individuals. 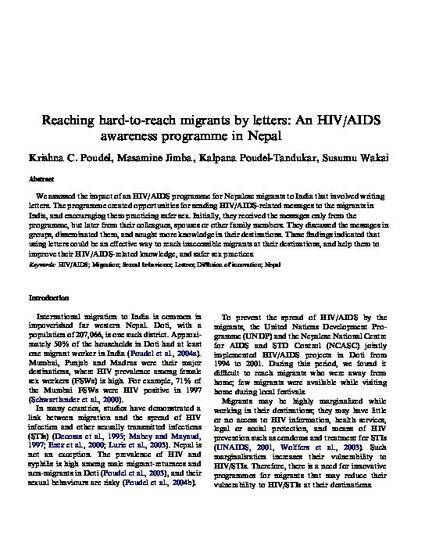 This study was partially supported by a Grant for Research on Global Health and Medicine (21A-2) from the National Center for Global Health and Medicine, Japan; and by a Grant-in-Aid for Young Scientists (B22790581), Japan Society for the Promotion of Science, The Ministry of Education, Culture, Sports, Science and Technology, Japan, UMass SOAR Fund.